The president’s plan to devalue the bolivar, peg it to an obscure state-backed cryptocurrency and raise the minimum wage will widen the already gaping hole in the OPEC member’s finances. Promised fuel-price hikes, if botched, could send his socialist government to the seabed. 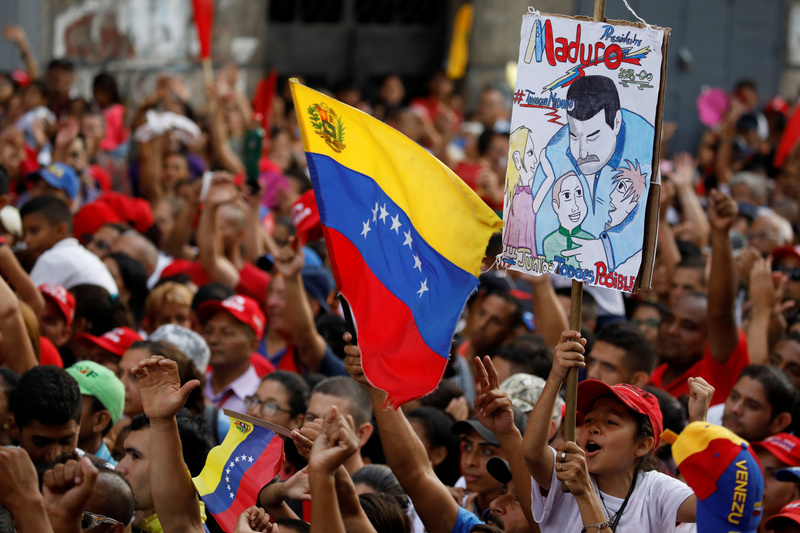 Supporters of Venezuela's President Nicolas Maduro carrying a placard depicting him and waving a Venezuelan flag attend to a campaign rally in Caracas, Venezuela May 4, 2018. Venezuela on Aug. 20 slashed five zeros from prices as part of a broad economic plan that President Nicolas Maduro says will tame hyperinflation. Shops were closed due to a national holiday that Maduro decreed for the first day of the new pricing plan for the stricken economy, which the International Monetary Fund has estimated will have 1 million percent inflation in 2018. The price change comes with a 3,000 percent minimum wage hike and tax increases meant to shore up government revenue and a plan to peg salaries, prices and the country's exchange rate to the petro, a state-backed cryptocurrency.